Printing small labels for electronic components, printed circuit boards, test tubes and vials can be challenging for rival label printers. With the 3240, however, it's a snap due in part to two important technologies: 400 dpi print resolution and Intermec's patented PrecisionPrint technology for perfect label-to-label image resolution. Intermec's exclusive PrecisionPrint technology ensures continuous image registration on the label within a tolerance of 0.030". Even on the smallest labels measuring only 0.1" in length where problems with image registration show up immediately, the 3240 excels. 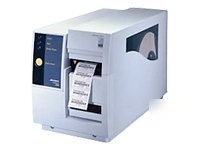 In addition to printing on small or oddly shaped labels, the 3240 is perfect for printing on a variety of difficult to print on substrates, such as Kaptron or ultra-smooth polyesters and synthetics. That's why so many organizations in electronics, pharmaceuticals, telecommunications and health care have turned to Intermec for printers. Beyond the power and precision, the 3240 is the printer of choice when the application calls for extremely small label printing of complex images on unique label materials.